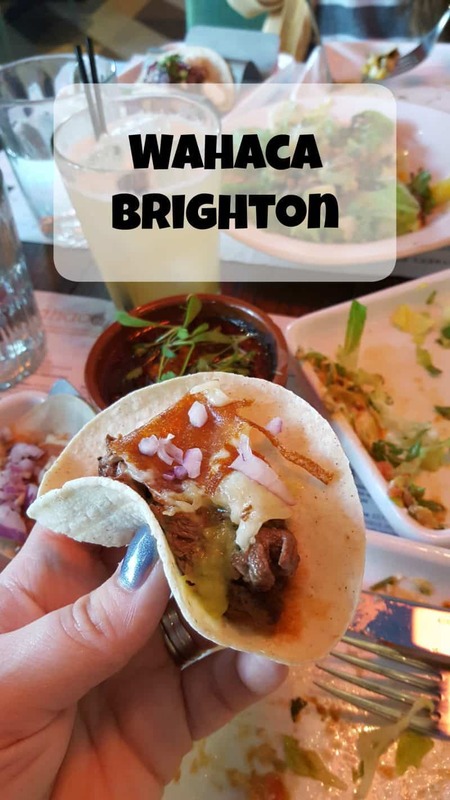 After what seems like months since I knew Wahaca was arriving in Brighton I finally got to enjoy a meal there last night and boy was it worth the wait! I’m a huge fan of Mexican food although I don’t like really spicy things I find that most Mexican dishes combine so many different flavours that my reluctance to try really spicy things doesn’t matter! The new Brighton restaurant is on the corner of North Street and New Road, so perfect for a pre theatre meal or post shopping refuel! Despite my booking being for 5.30 the restaurant was almost full when we arrived! 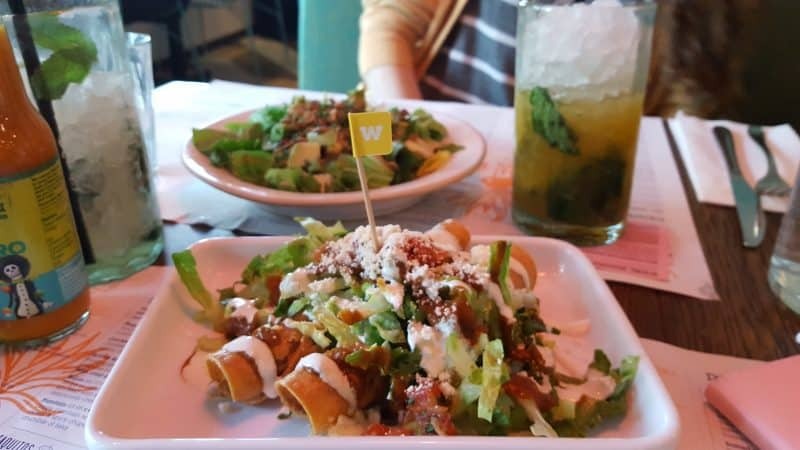 As Wahaca is based on traditional Mexican style dishes there are lots of smaller dishes to choose from in the Street Food menu, so you could order a few and share with friends and just dip in and out, tapas style. There are also bigger dishes for those who can’t (or won’t) share! I was dining with my friend Skye who is a ceoliac, so cannot have any gluten or wheat whatsoever and we were both really impressed with how seriously the team took it. Skye was given a separate menu detailing what she could order, and it also specified what the kitchen team would do to ensure no cross contamination (fresh food prep gloves, dishes, knives etc) which really put her mind at ease, and she had no trouble with any of the food. After out meal we briefly chatted to the founder of Wahaca, Thomasina Miers and complimented her on the GF aspect and she explained that her sister is a Coeliac which is why she and her teams take it so seriously as they understand the potential consequences! Food arrives as it is ready, and everything was really well presented, we chose three items from the street food selection: Chicken Taquitos, Filet Steak & Cheese tacos and Rajas (chargrilled peppers with spinach and corn) and two sides, the Frijoles with chorizo (twice cooked black beans with cheese) and the corn and bean salad, which was liberally sprinkled with avocado. Everything was full of flavour, nothing too overpowering. 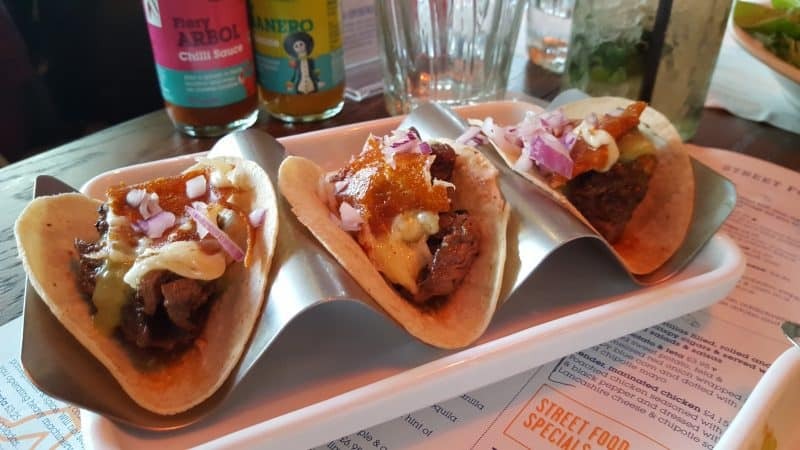 My favourite dish was the steak Tacos, perfectly cooked steak and just the right amount of toppings. Next time I come though I’ll try something from the ‘bigger food’ menu though, the Chicken Tinga sounds amazing. There is also a kids menu available, as I’m sure I’ll have the little people with me next time! 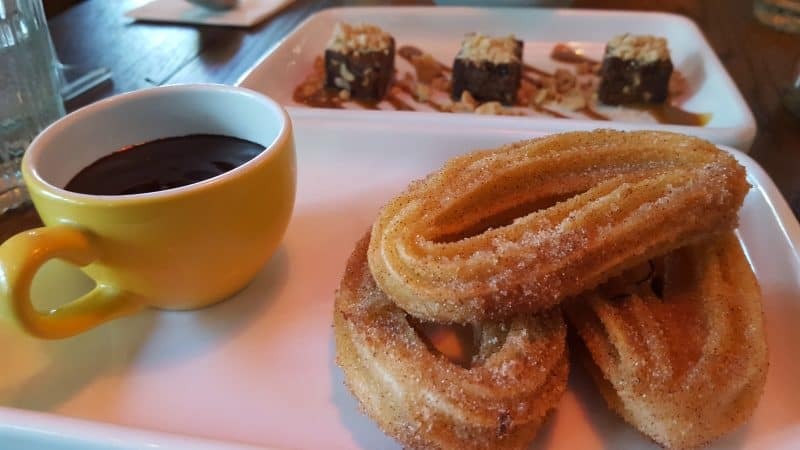 Obviously there were Churros on the menu, I am ashamed to say I couldn’t manage them all but they were superb, I also tried the Honeycomb chocolate bites which were rich and smothered with roasted peanuts, really moreish! Skye had the Salted Caramel Ice cream which was full of flavour and delicious! The drinks menu is ace, especially the Cocktails. There is also a tequila tasting option, three different tequilas served throughout your meal, though I wasn’t brave enough for that! I had the Passion fruit vanilla mojito and followed that with a Spiced daiquiri, which was a spiced rum with a kick of lime. Complimentary filtered water and tortilla chips are available throughout your meal too. I’ve only got a couple of minor niggles about our experience, the first is that some of the tables are so close together you feel like you should introduce yourself to your neighbours! It wasn’t a major issue for us as we weren’t on a romantic date and I of course understand that it’s so the have flexibility with tables to move them around depending on group sizes. Our table was also a little wobbly but this was fixed quickly with an adjustment to the base of the table. Finally, the toilet cubicle I chose to use had a wonky seat, it had come unattached at one side. I did love how clean and sleek the loos were and that each cubicle had plenty of spare loo rolls! Wahaca as a chain have just been given Carbon Neutral status, and we produce that is purchased from Mexico it is sourced direct from cooperatives which support local farming communities, two things that go to show me that they care for the environment and the people who inspire their food and ethos! You can find all the details for the new Brighton restaurant here, or call them 01273 934763. They take limited bookings for parties of 7 or more after 6pm, but I wouldn’t mind waiting in the bar with a cocktail if there is a wait for a table anyway! 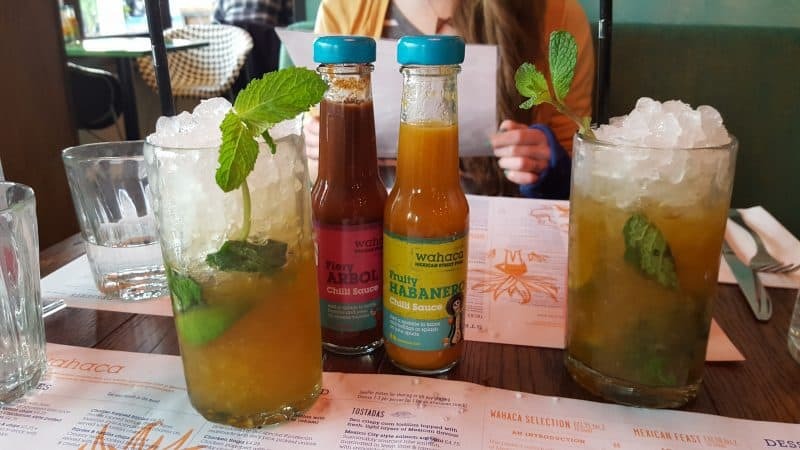 We were invited to try Wahaca on the house, all opinions are my own and unbiased. Oh it’s opened! It looks amazing, that cocktail looks right up my street! Can’t wait for my next visit to Brighton now! oh that sounds so nice. Brighton has had a real influx of Mexican restaurants in the last few years hasn’t it? I need to make it my mission to try them all.